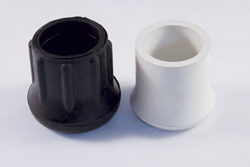 These rubber crutch tip glides are available in black (-B), white (-W) and gray (-G). They are non-skid and the white and gray types are non-marring. They are useful for crutches, walkers, canes, tables, chairs, etc. For hollow legs, we recommend using a washer in the bottom of the glide to keep leg from cutting through the glide.